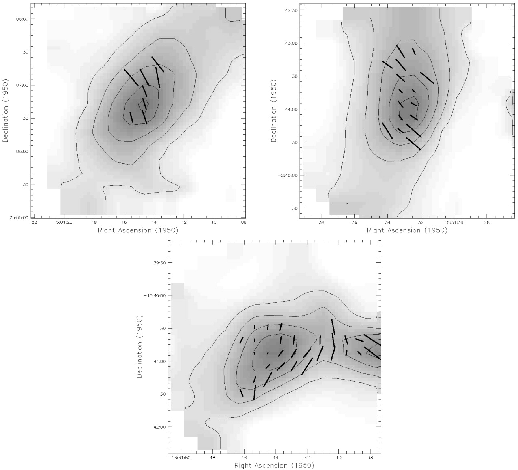 Figure 1.20 illustrates the polarization maps of three prestellar cores (L1544, L183, and L43) done in the 850 m band by JCMT-SCUBA. In L1544 and L183 the mean magnetic fields are at an angle of 30 deg to the minor axes of the cores. L43 is not a simple object; there is a T Tauri star located in the second core which extends to south-western side of the core (an edge of this core is seen near the western SCUBA frame boundary). And a molecular outflow from the source seems to affect the core. The magnetic field as well as the gas are swept by the molecular outflow. L43 seems an exception. The fact that the mean magnetic fields are parallel to the minor axis of the high-density gas distribution seems to mean gas contracts preferentially in the direction parallel to the magnetic fields. Figure 1.20: Directions of B-Field are shown from the linear polarization observation of 850 m thermal emission from dusts by JCMT-SCUBA. L 1544 and L183, the magnetic field and the minor axis of the molecular gas distribution coincide with each other within deg. Taken from Ward-Thompson et al (2000).